An extremely rare and never sold limited edition humidor hand crafted by Cigar Aficionado’s No. 1 rated humidor designer in the world, Daniel Marshall, is among the special auction items that will be part of the live auction at the Leonardo DiCaprio Foundation Annual Gala in Saint-Tropez, France. This one-of-a-kind humidor is personally signed by Governor Arnold Schwarzenegger and includes a gold covered solid brass Governor of California Seal. A truly unique collector’s piece, the humidor is packed full of Governor Schwarzenegger Signature Daniel Marshall Red Label Churchill Cigars. Schwarzenegger presented these cigars to visiting dignitaries to his office in the California Capitol during his terms as Governor. Also included are two Daniel Marshall 24 karat Red Label Golden Torpedo Cigars. Davidoff Special "R" Cigars complete this auction lot. 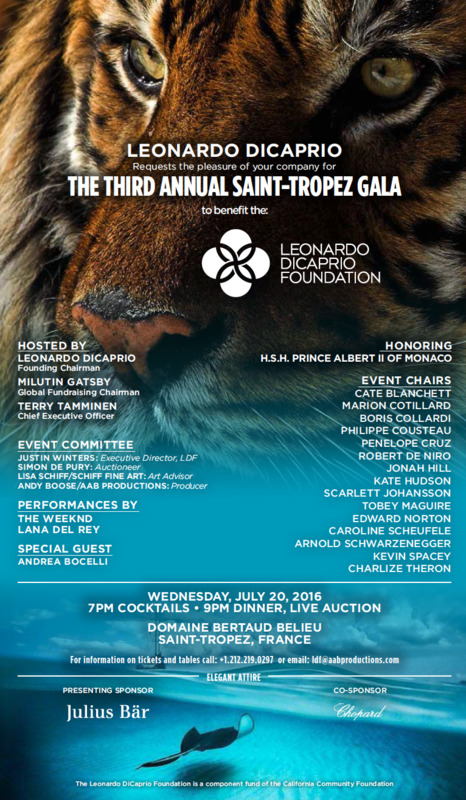 "We are proud to partner with The DiCaprio Foundation. To create this rare collector’s piece that is hand crafted using wood from forests that provide renewable lumber is a great honor and privilege,” said Marshall. “Congratulations to Leonardo DiCaprio and his incredible partners and team for their vision and absolute commitment. A vital cause is to protect our planet and implement renewable resources and energy to ensure health, safety and prosperity for our children and all future generations. One world, one people, one life." Daniel Marshall, a 33-year veteran of the cigar industry is one of the world’s leading names in No. 1 rated top quality humidors and finest cigars, including the coveted 24kt Red Label Golden Cigar. DM Humidors are enjoyed in the homes and offices of countless Hollywood celebrities, US presidents, dignitaries, titans of industry, and fashion designers among others. Marshall is also a cigar and humidor supplier of England’s Royal Family. Since 1982, Daniel Marshall has created and designed for the prestigious luxury gift houses Dunhill, Tiffany & Co., S.T. Dupont, Cartier, Hermes, Fred Joaillier, Harrod’s, Bally of Switzerland and Garrard’s of London. Daniel Marshall’s humidors are historic, with a collection on display at the Smithsonian Museum. Visit Daniel Marshall’s site at http://www.danielmarshall.com. You can also find Daniel Marshall on Facebook at http://www.facebook.com/danielmarshallhumidorsandcigars or follow Daniel Marshall on Twitter @DMCigarWorld or Instagram @DMCigars for real-time updates. Leonardo DiCaprio Foundation Auction BookFull description of Daniel Marshall Humidor and Cigar Auction Item Invitation Leonardo DiCaprio Foundation GalaInvitation to the Third Annual Gala of the Leonardo DiCaprio Foundation Daniel Marshall Humidor with Arnold Schwarzenegger and Sylvester StalloneArnold Schwarzenegger gave Sylvester Stallone a hand crafted Daniel Marshall Humidor. 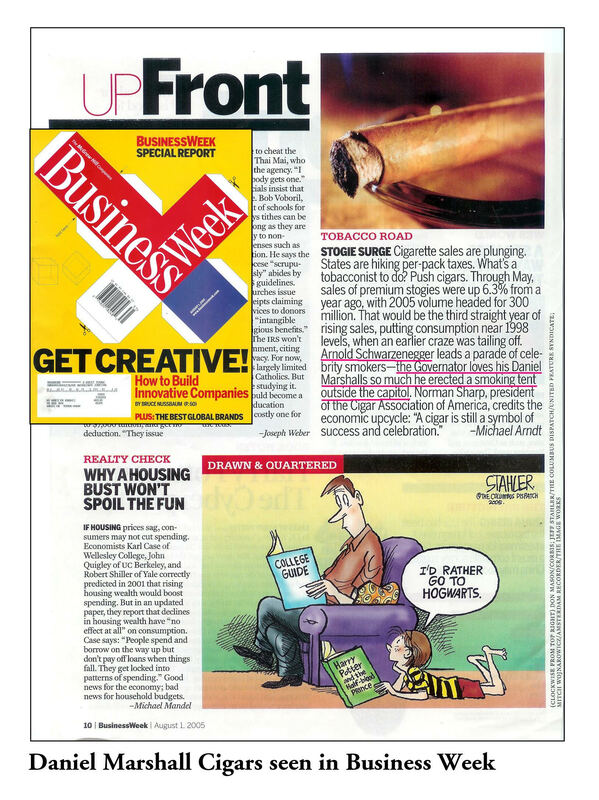 Daniel Marshall Business Week ArticleArnold Schwarzenegger and his love for Daniel Marshall Cigars.